Anyone can hire out the club, you don't have to be a member! 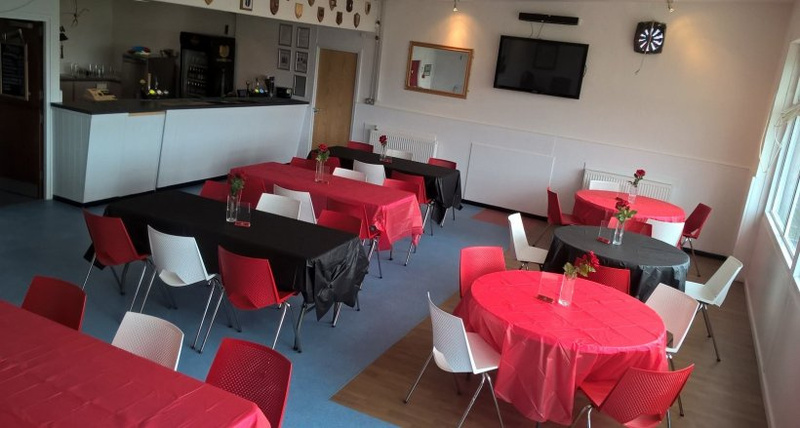 We have a medium sized upstairs hall which can hold up to 100 people, licensed bar, small conference room, large balcony, kitchen, TV, changing rooms and free parking. We can also provide a DJ for your event. The club has been hired out in the past for birthday parties, kids discos, club nights, 70's nights. Formal business uses such as First Aid Training, business meetings and use from Hampshire RFU. We are located very close to Fareham town centre with just under a 10 minute walk to Fareham High street and the train station. The main clubroom is an open plan room including tables & chairs, bar and access to the balcony, kitchen and conference room. We can provide the DJ sound and the lighting for you event. The young DJ is a great hit at the club. With music ranging from the early 70's right through to the modern day, he plans his discos to your needs. We will provide qualified, fun and friendly bar staff for your event. You do not have to worry about supplies as you use ours! The Kitchen is available to hire, we do not provide staff for this. The small conference room is situated upstairs next to the bar. This comes with several tables and seating. A projector is available to use in the main hall. Toilets and changing rooms are situated down stairs under the main hall. The changing rooms are equipped with full showering facilities as required. To hire the clubhouse costs £150, with a £50 non refundable deposit. This covers cleaning cost etc. If the bar is required a further charge of £50 is required. Please email barmanager@farehamheathens.co.uk with your requested dates and we will be able to confirm if the club is available.